[Update: 10:20 p.m. ET, 4:20 a.m. Oslo] At least 80 people are dead as a result of a rampage Friday on Norway's Utoya Island, police said Saturday. Norwegian authorities say the attack, which occurred at the ruling Labour Party's youth camp on an island outside the capital, was linked to a bombing earlier Friday in the heart of Oslo. 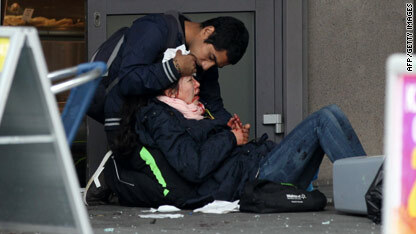 The death toll from the bombing still stands at 7, Norwegian Police spokesman Are Frykholm told CNN. A 32-year-old Norwegian man is in custody, he said. "For now we have arrested one person and he is being held in custody and we are investigating further based on information we're getting from him," he said. [Update: 8:15 p.m. ET, 2:15 a.m. Oslo] The scene after a bomb exploded in the center of Oslo on Friday reminded New Yorker Ian Dutton of what he witnessed after the September 11, 2001, terrorist attacks in the United States. The scale of the Oslo explosion was smaller than that of 9/11, but the stunned feeling and confusion in the aftermath were eerily similar. "Seeing the emergency response gives me that same feeling in my spine of being in someone's crosshairs," Dutton said. [Update: 6:54 p.m. ET, 12:54 a.m. Oslo]The official death toll as a result of Friday's explosion in Oslo stands at 7 and 90 people have been hospitalized, a spokesman for the city's mayor said. Police have finished searching damaged buildings for dead and injured, spokesman Erik Hansen said. One of the city government's chief concerns overnight is finding shelter for the numerous elderly people whose homes were damaged in the blast, Hansen said. [Update: 5:40 p.m. ET, 11:40 p.m. Oslo] Undetonated explosives were found on Utoya Island, where a gunman opened fire earlier in the day on a Labour Party Youth Camp, Oslo, Norway, acting Police Chief Sveinung Sponheim said late Friday night. [Update: 5:07 p.m. ET, 11:07 p.m. Oslo] A Norwegian man was arrested Friday in connection with attacks in Norway, officials said at a press conference Friday. Norwegian Justice Minister Knut Storberget said Friday that he was not familiar with "any threats connected to these attacks," a reference to a large explosion in Oslo and a mass shooting on Utoya Island. Prime Minister Jens Stoltenberg added that it is "too early to say anything about motives." [Update: 5:02 p.m. ET, 11:02 p.m. Oslo] Norway will stand together after a pair of deadly attacks Friday and won't be bombed into silence, the country's prime minister said Friday. "And when tomorrow comes, let’s show the world that the Norwegian democracy still stands strong. The most important thing tonight is to take care of each other." [Update: 4:12 p.m. ET, 10:12 p.m. Oslo] At least 9 people were killed in a shooting Friday at Norway's ruling party youth camp on Utoya Island, police in Norway said. The two attacks are definitely linked, a police spokesman said. The person detained in Utoya was allegedly seen around the government building at time of explosion. The man, who is still being questioned, is tall with blonde hair, “Nordic appearance,” police said. Elsewhere, New York City's police department deployed "critical response vehicles and other resources" Friday to protect the consulates of Norway, Denmark, Finland and Sweden after a pair of deadly attacks in Norway, Deputy Commissioner Paul J. Browne said. Police in New York, which was a site of the September 11, 2001, terrorist attacks, are monitoring events in Norway "for further details and possible motives, but we have no information at this time indicating a specific threat against New York City," Browne said Friday. [Update: 4:04 p.m. ET, 10:04 p.m. Oslo] A US official says it is still “really unclear” who is behind the explosion and shootings in Norway. “This doesn’t have the hallmarks of a big sophisticated attack,” the official said. The official also said it is not clear whether the Norwegian Prime Minister was the target or whether it was someone or something else. A U.S. counter-terrorism official also said it is "too early in the game" to know who is responsible for the attacks. The official said there had been nothing to lead officials to believe something was imminent in Norway. [Update: 3:08 p.m. ET, 9:08 p.m. Oslo] Oslo University Hospital confirmed they have 11 people seriously wounded from the attack in downtown in the hospital. They also now have eight people wounded from the shooting on the island. The hospital could not provide the condition of those eight people. [Update: 3:08 p.m. ET, 9:08 p.m. Oslo] Emily Anderson of Fargo, North Dakota, was in a store a block from the blast with a younger sister and a younger cousin. Four blocks away, Dawn Lubka was in her hotel room at the Comfort Hotel Børsparken when the blast went off. At first she just assumed it was a construction accident, as there are lots of new buildings and a new opera center going up on the block. When she talked to the concierge and looked online, she found out what had really happened. [Update: 2:39 p.m. ET, 8:39 p.m. Oslo] U.S. President Barack Obama extended his condolences to the victims of the violence in Norway on Friday, saying the incidents are "a reminder that the entire international community has a stake in preventing this kind of terror from occurring." Obama said the United States is prepared to assist in Norway's response to the violence. "Our hearts go out to them," he said. [Update: 2:37 p.m. ET, 8:37 p.m. Oslo] Jane Owen, the British ambassador to Norway, told CNN that the attacks today signifies a new reality for the country. "Like many other countries, Norway has been working to combat the risk of terrorism," she said. "But as we all have experienced, you can never be totally prepared for the horror and tragedy that unfolds when you have a major terror incident." [Update: 1:58 p.m. ET, 7:58 p.m. Oslo] Seven people were killed in an explosion in downtown Oslo, Norway, on Friday, police said. Two people were severely injured, they said. [Update: 1:46 p.m. ET, 7:46 p.m. Oslo] Fabian Stang, the mayor of Oslo, Norway told CNN that "this situation is under control, but it's been a terrible day." "Today we think about the people in all other parts of the world who have been in the same situation," Stang said. "We are of course shocked." He confirmed police reports that there was a bomb attack, but said they were unsure if it was a terror attack. "It's a terrible situation" either way, he said. Stang said he was also distraught about the shooting at the youth camp where young people had been killed. "They are 16, 17 years old and they should not be treated like that," he said of some victims. Stang said while he felt in some ways the city had been under attack, Oslo would prevail. "We will take the city back," he said. [Update: 1:54 p.m. ET, 7:54 p.m. Oslo] Two people are confirmed dead and 15 injured in an explosion in central Oslo on Friday, police told CNN on Friday. Police are urging the public to limit the use of cell phones in order to keep networks free. A political adviser for Norway's Labour Party told CNN that Norwegian media were reporting that seven people were killed and more very badly wounded. [Update: 1:46 p.m. ET, 7:46 p.m. Oslo] NATO's Secretary General strongly condemned the attack in Norway. "On behalf of NATO, I condemn in the strongest possible terms the heinous acts of violence in Norway. I would like to convey my sincere condolences to the Norwegian government, the Norwegian people and the families and loved ones of all those who suffered in these cruel and cowardly acts," the statement said. "Our solidarity with Norway remains steadfast. NATO countries stand united in the battle against these acts of violence." [Update: 1:38 p.m. ET, 7:38 p.m. Oslo] The police have good reason to believe there is a link between the shooting on an island where a Labour Party youth camp was taking place and an explosion in central Oslo earlier, police spokesman Bjorn Erik Sem-Jacobsen tells Norwegian state broadcaster NRK. He is the spokesman for the police station nearest to Utoya island, where the camp is being held. The prime minister, whose office was badly damaged by the blast, leads Norway's Labour Party. [Update: 1:30 p.m. ET, 7:30 p.m. Oslo] Morten Vaage was about 800 meters away from the explosion in Oslo when it happened. Before that, he’d been at a parade to welcome his brother and other soldiers back from Afghanistan. “The Norwegian Defense Minister was there to address the soldiers, and emphasized how lucky we are to live in this country of Norway, where we are safe and free. She emphasized how much our effort means in order to build a safe and free country in Afghanistan, and again linked this to our good life in Norway,” Vaage, an iReporter said, noting the sharp contrast between her words and the subsequent explosion. “It did not feel like Norway,” he said. “I heard the explosion and the whole central [train] station shook...people were shocked, some were crying, some were bleeding." [Update: 1:23 p.m. ET, 7:23 p.m. Oslo] One person has been arrested on a Norwegian island where someone dressed as a policeman has been firing at a Labour Youth Party Camp, a police representative tells Norwegian state broadcaster NRK. Witnesses tell NRK the scene is chaotic and many shots have been fired. [Update: 1:10 p.m. ET, 7:10 p.m. Oslo] NRK journalist Linda Reinholdsen told CNN she was told many of the youth have been evacuated from the mainland island where a shooter has opened fire. But not much more detail than that is known. Reinholdsen also said that there is an indication that the death toll may climb from the blasts. [Update: 1:08 p.m. ET, 7:08 p.m. Oslo] Heide Bronke, a State Department Spokesperson, said the U.S. condemns "these despicable acts of violence." "We are continuing to monitor the situation, including the safety and security of U.S. citizens," Bronke said. "Our hearts are with the victims and their families, and we have reached out to the Norwegian Government to express our condolences." The U.S. has no confirmation of U.S. citizens who were hurt, she said. [Update: 1:05 p.m. ET, 7:05 p.m. Oslo] National Security Council spokesman Tommy Vietor tells CNN: “The president was briefed on the explosion and reported shootings in Oslo by Deputy National Security Adviser for Homeland Security and Counterterrorism John Brennan. [Update: 12:51 p.m. ET, 6:51 p.m. Oslo] iReporter Ulrik Fredrik Thyve said he was in his office when the blast occurred. “The explosion was immense. My office felt like it contracted, expanded and windows were blown all over the building. Dust, smoke, people [were] bleeding everywhere. I walked out and towards ground zero to see if there was anything to do,” he said. Thyve, who is also a freelance photographer, took some pictures of the area. “Police evacuated us all,” he said. [Update: 12:50 p.m. ET, 6:50 p.m. Oslo] A person dressed as a policeman has fired shots at the Labour Party Youth Camp on Utoya Island in Norway, Norwegian state broadcaster NRK and the press representative for the Norwegian state secretary said Friday. Many people are injured. NRK says the shooting is continuing. It says there are about 700 people at the camp. 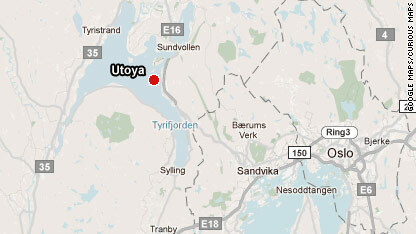 The location of Utoya Island in Norway, where a shooter has apparently fired shots at a youth camp. [Update: 12:48 p.m. ET, 6:48 p.m. Oslo] Shots were fired at an Oslo youth meeting following the blast, police told Reuters, quoted by CNN TV. No further details were available. A reporter with State TV broadcaster NRK is reporting that there is mass confusion within the city. The cause of the blast remains unknown, and no one has claimed responsibility. CNN terrorism analyst Paul Cruickshank said it was far too early to draw any conclusions on whether it was terrorism and who would carry it out. But, he said, by looking at the extent of the damage, it was plain to see the hallmarks of a major attack. Cruickshank said that in recent months, there had been increased "chatter" about Norway, which had been investigating militants suspected of being linked to al Qaeda. Norway also drew the ire of al Qaeda for publishing the controversial political cartoons of the Prophet Mohammed that appeared in a Danish newspaper and sparked outrage in the militant Islamic community. The Scandinavian country also plays a part in NATO's operation in Afghanistan, and now, in Libya. Norway has been largely spared from terrorism. But last December, an attempted suicide bombing in Stockholm shocked neighboring Sweden. In July of last year, Norwegian authorities announced the arrests of three suspects in connection with an investigation into terrorist plots in New York and the United Kingdom. The three were suspected of plotting terrorist attacks and having connections to al Qaeda, the prime minister's office said at the time. Stoltenberg, who has been prime minister since October 2005, heads a coalition government made up of the Labour Party, the Socialist Left Party and the Centre Party. [Update: 12:31 p.m. ET, 6:31 p.m. Oslo] iReporter Ian Dutton of New York told CNN when the explosion occurred he was sleeping in his hotel room. "The concussion was [such] that I felt like my bed was struck by lightning … I thought it was an earthquake but Norway is not prone to earthquakes," he said. He said immediately after the blast, people on the streets seemed stunned.“There wasn’t even initial panic, but more of a shock or ‘how could this be?” he said. The streets in the blast zone were strangely quiet after the commotion, he said. "Generally it’s a pretty-hopping downtown area, but not now," he said. "The bystanders are being kept quite a distance away." 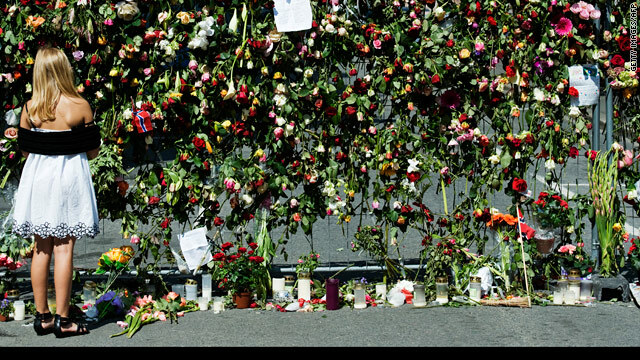 The site of Friday's blast in Oslo, Norway. [Update: 12:11 p.m. ET, 6:11 p.m. Oslo] State TV broadcaster NRK confirmed at least two people are dead following an explosion that rocked downtown Oslo, Norway. [Update: 12:08 p.m. ET, 6:08 p.m. Oslo] Asgeir Ueland, a journalist with Norwegian state broadcaster, said as soon as the explosion occurred it smelled like a burned tire and he knew it wasn't just a gas explosion. "I knew right away it was an explosion," Ueland told CNN. Ueland, who said he has reported in the Middle East, compared attacks he has seen there to what he experienced Friday in Norway. "This was bigger than anything I've seen," he said of other blasts he's seen. Ueland described the reaction as groups of people in a state of shock. "There were a lot of people running away crying and screaming," Ueland said. [Update: 12:02 a.m. ET, 6:02 p.m. Oslo] Joakim Vars Nilsem told CNN that after the blast many people in Oslo were simply in panic and trying to figure out if there was an attack or an explosion going on. [Update: 11:53 a.m. ET, 5:53 p.m. Oslo] Ian Dutton, an airline pilot who arrived in Oslo Friday, heard a powerful blast and observed the aftermath from the vantage point of his 28th floor hotel room. "It rocked me out of bed," he said. Dutton, who lives in New York City, said that the scene reminded him of what he witnesses on September 11, 2001 there. "Seeing the emergency response gives me that same feeling in my spine of being in someone's crosshairs," he said. 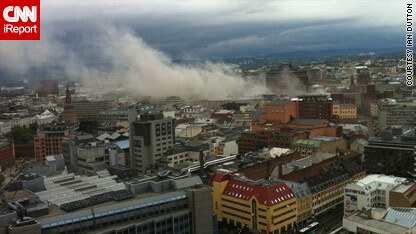 Ian Dutton, an iReporter, took this photo of the blast in Norway from his hotel room. The building that suffered the explosion had a heliport on its roof, and now had beams hanging from it, Dutton, an iReporter, said. Most of the windows were blown off and curtains were dangling. "I can see the warped metal of the building," he said. There was a line of yellow ambulances by the scene, and a police cordon that kept onlookers back. "I didn't know Oslo had so many ambulances," he said. [Update: 11:46 a.m. ET, 5:46 p.m. Oslo] Jon Martin Larsen, head of media for the Norwegian Red Cross, told CNN: "The Norwegian Red Cross has established its own crisis team and is in contact with the municipality of Oslo and the police, ready to assist with whatever they need of first aiders, rescue teams, ambulance or caretakers either in the city center or at the hospitals." [Update: 11:23 a.m. 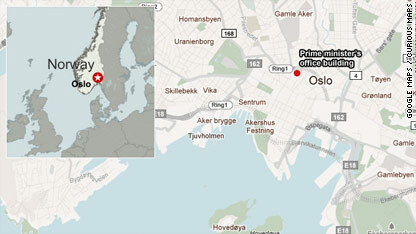 ET, 5:23 p.m. Oslo] A bomb exploded in a government area, a press officer at Oslo Police Station confirmed to CNN. “There has been a bomb explosion in the government area," the officer said. "At least one person is dead and a number of people are injured, we don’t have the exact number yet." 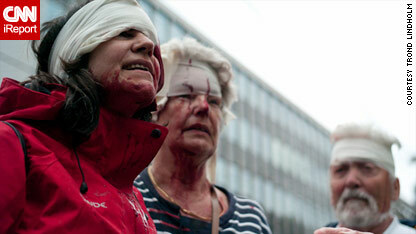 Medics treat some of the injured at the scene of an explosion in Oslo, Norway. But that spokesperson said so far they don't know what the cause was. "We don’t know if this comes from a terrorist action, we don’t know yet. We don’t know exactly how many explosions were yet," the spokesperson said. "Oslo Center has been evacuated." 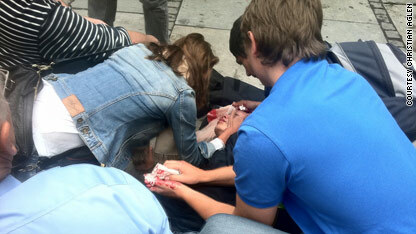 People rush to help what appears to be an injured woman after a blast in Oslo, Norway. A U.S. official says it is too soon to tell what caused the explosion in Oslo or whether it is a terrorist attack. The possibility of terrorism is always a concern because of the ongoing threat from al Qaeda to launch attacks in Europe. [Update: 11:21 a.m. ET, 5:21 p.m. Oslo] Hans Kristian Amundsen, state secretary of Norway, said the country's prime minister was safe and working at an undisclosed location. [Update: 11:03 a.m. ET, 5:03 p.m. Oslo] Norwegian state broadcaster NRK says at least one person has died after a huge explosion rocked the center of the capital, Oslo. 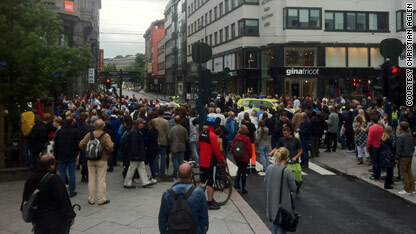 Dozens more are being treated in hospitals, NRK said, and all roads leading to the center of Oslo have been blocked. 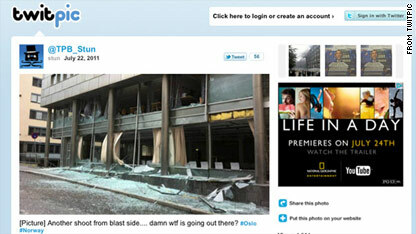 A photo posted on Twitter via photo service Yfrog.com shows damage from a blast in Norway. [Update: 11:00 a.m. ET, 5:00 p.m. Oslo] A hotel worker in Oslo's Grand Hotel, about a five-minute walk from the government building, said everyone in the hotel felt and heard the explosion, which felt like someone was shaking the entire building. "It's crazy," she said, not wanting to be identified because she is not authorized to speak to the media on behalf of the hotel. "This happens in the big world, not in Oslo. I'm shocked." Vivian Paulsen, media adviser for the Norwegian Red Cross, lives 20 minutes away from the center of Oslo in the northern outskirts of the city. She said she heard a "huge blast." "I heard the big bang, I didn't think it was anything serious. I can still see smoke coming up from the place," she said, watching from her apartment balcony. She also heard sirens and ambulances. As for Oslo, she said what others have been saying: Events like this don't happen in the northern European capital. "There's occasional arrests of terror suspects we read about in the paper, or people planning something. I can hear ambulances and sirens." [Update: 10:48 a.m. ET, 4:48 p.m. Oslo] Nick Soubiea, an American-Swedish tourist in Oslo, told CNN he was less than 100 yards from the blast, which he described as deafening. "It was almost in slow motion, like a big wave that almost knocked us off our chairs," he said. "It was extremely frightening." He said the streets were crowded with people trying to get away from the center of the city. "There are people running down the streets, people crying, everyone's on their cell phones calling home," he said. Crowds evacuate from downtown Oslo, Norway after an explosion. [Update: 10:47 a.m. ET, 4:47 p.m. Oslo] A spokesperson for the Legevakten Hospital in Oslo, Norway confirmed the blasts in the downtown area but said they weren't sure how bad it was. "Right now we are not too sure what has happened, we are watching the news and talking to the other hospitals," the spokesperson said. "We don’t know what caused it or how many people are injured." [Update: 10:36 a.m. ET, 4:36 p.m. Oslo] One explosion happened near a government building housing the office of Prime Minister Jens Stoltenberg, said the reporter, Linda Reinholdsen. Another hit near the Norwegian parliament, she said. 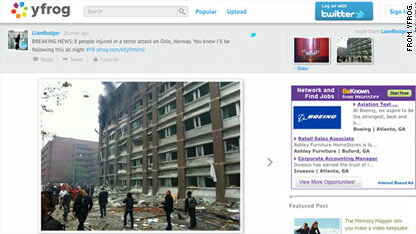 A photo posted on Twitpic and then on Twitter shows damage from the blasts in Norway. Several buildings in Oslo were on fire, she said, and smoke was pouring from them. Gibbs, the journalist with Reuters, said he believes one explosion happened on an upper floor of a main government building. He said it blew out every window on the side of the building where the blast occurred. One of the blasts damaged the Oil Ministry and left it in flames, he said. [Update: 10:16 a.m. ET, 4:16 p.m. Oslo] At least one of the explosions happened near some government buildings, said Walter Gibbs, a journalist with Reuters. He said he saw eight injured people, including two or three with serious wounds and one who looked dead. Reuters reported that the prime minister was safe. iReport: Are you there? Send stories, video. [Update: 10:11 a.m. ET, 4: 11 p.m Oslo] A second blast was heard in central Oslo shortly after an initial explosion rocked the city, a reporter for Norwegian state broadcaster NRK told CNN Friday. Linda Reinholdsen said there was a state of confusion in the city and several government buildings were affected. See photos from Norway state TV. [10 a.m. ET, 4 p.m. Oslo] An explosion rocked a part of central Oslo, Norway, on Friday, state TV reported. State TV broadcaster NRK said on its website that windows in several buildings had been blown out and people were in the street bleeding. News reports suggest the government building has been affected. stupid ppl claiming this is just a conspiracy... I actually live here and have seen it for myself. alot of ppl are dead. REAL SHOOTING IN UTOYA or NORWEGIAN "AFTERLIFE" $$ FLASH MOB !!? stateofterror.blogspot.com/ or stateofterror.wordpress.com/ REAL TEARS OR TEAR GAS AND PURE THEATER ON FACES OF MANIACS !!? OSLO POLICE or COMMUNIST/LIBERAL CRIMINALS WHO WERE PREPARING FOR ACT OF TERROR AGAINST NORWAY AND EUROPE ALMOST HALF DECADE(collecting proofs and photos) AHEAD !!? WILL THERE BE APOCALYPSE NOW(Abomination) OR TOTAL RESISTANCE(civil war) !!? No doubt about bombing in Oslo, but what about shooting in Utoya !!!? ARIZONA = UTOYA and STOLTENBERG = BREIVIK (90 minutes vs 30 and for government vehicles or police even 20 minutes the most) !!! Simply killing some in between class time on Digg and I found your article . Not normally what I want to examine, but it was completely worth my time. Thanks. news.blogs.cnn.com es excelente. Hay a menudo toda la información correspondiente a las sugerencias de mis dedos. Gracias y mantener el trabajo superior! Muchas gracias por el esfuerzo de desarrollo para discutir esto, me parece muy importante esto y como estudiar mucho más sobre este tema. Si es posible, a medida que adquiera experiencia, ¿le importaría actualización news.blogs.cnn.com tener una gran información mucho más? Es muy beneficioso para mí. Problemas tremendos en news.blogs.cnn.com. Estoy muy satisfecho con compañeros de su artículo. Muchas gracias y estoy mirando hacia adelante para tocar. Será tan amable de enviarme un correo?